Where can I buy ‘Lab Rat’? 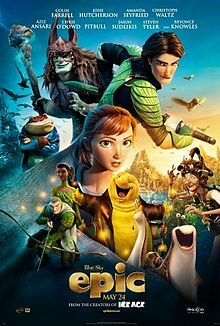 With only the visually impressive display in the theater lobby and the movie trailer I’d seen at a previous show, while I knew I wanted to see Blue Sky’s newest animated film, Epic, I wasn’t entirely positive what kind of movie it would be. A young human woman shrinking down in a forest and meeting a magical race that lives there protecting the place sounds a lot like Fern Gully. Visually, the Boggans that were the force of corruption looked much more like orcs from Lord of the Rings, just smaller. Unfortunately, while enjoyable, Epic needed to be a little bit more to live up to its title. This animated 3D film misses being truly fantastic due to many small reasons, rather than any one glaring mistake. This certainly keeps the movie enjoyable, but doesn’t push it into the realm of being a fabulous adventure that tugs on one’s emotions. With the last two films I’ve seen in theaters being Star Trek Into Darkness and Iron Man 3, this movie just fell short of wowing me like they did. This might be an unfair comparison, so I will also say that the last animated 3D family film I saw, The Croods, was more “Epic” than this film. Certainly, the plot doesn’t push itself. It is a bit cliché, having the good forces of the Leafmen fighting the evil forces of the Boggans. The magic of Queen Tera (voiced by Beyoncé Knowles) keeps the corruption of the greedy Mandrake (voiced by Christoph Waltz) in balance within the forest. This is unacceptable to the wicked leader, so he hopes to strike during the time she selects her heir, which happens only once every hundred years, when the moon is full during the height of the summer solstice. Within the larger area of this forest there is the human Bomba (voiced by Jason Sudeikis), an eccentric scientist and father of Mary Katherine (“I go by M.K. Now”, voiced by Amanda Seyfried), who pays him a visit after years of separation. She hopes to reconnect with her father after the recent passing of her mother, but finds his obsession with finding an advanced civilization of tiny people living in the forest just as crazy as her mother – and the scientific community as a whole. Again, a little cliché, but this theme of parents and children trying to connect appears in multiple places through the cast. In addition to M.K. feeling she cannot connect with the only parent she has left, there is the relationship between General Ronin (voiced by Colin Farrell) and Nod (voiced by Josh Hutcherson). These characters do not have any actual blood relation, but the general has been trying to watch out for Nod as he is the son of a good friend and fellow Leafmen member who passed away. Nod has found himself unable to live up to the expectations of the leader of the military forces defending the queen and forest, which keeps them both upset with each other. Mandrake’s son, Dagda (voiced by Blake Anderson) works hard to make his father happy and emulate him. At the start of the show these two seem to have the closest relationship, even if it isn’t perfect, of the three parent relations. Unfortunately, while all of these potentially very emotionally moving relationships exist in the movie, none of them pick up enough weight to become emotionally moving. They’re just parts of the whole story instead of their own tales being told alongside. The parenting theme is more loosely continued on into the main plot as well, which focuses on Queen Tera’s heir. It is the selection of, protection of, and potential corruption of the pod that will pass on the Queen’s power over the forest that forms the central story. Through the telling of this we manage to see the few flashes of something Epic that, unfortunately, do not last quite long enough. The first hint of an Epic story is in the huge Boggan attack that forces Queen Tera to flex her Mother Earth powers as she tries to escape, and ends with M.K. being shrunk down and pulled into the role of guardian for the pod. The revelation of the massive numbers of Boggans and the Queen’s power was impressive. I am not sure if this lack of a sense of urgency and intensity was purposeful or not. I could see it being something they chose to avoid to try and keep the whole more family friendly. On the plus side, the comedy relief characters were not obnoxious for the sake of easy humor. 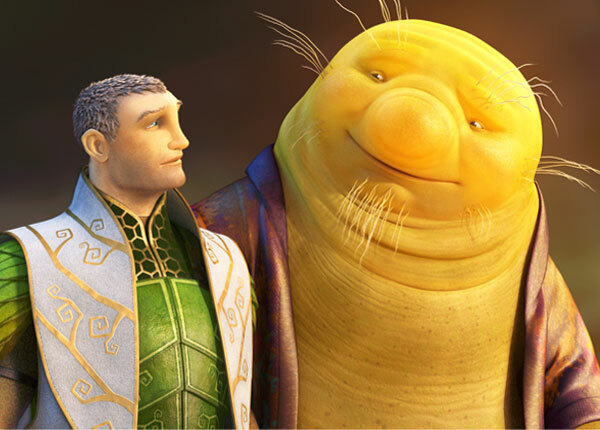 Mub (the snail voiced by Aziz Anasari) and Grub (the slug voiced by Chris O’Dowd) did add amusement in places without going over the top. They even had their own separate personality traits. Mub wanted to be a Leafmen while Grub was sure that M.K. was into him, so saw Nod as a rival for her affection. The characters were certainly imperfect, but not to the extreme level that so many animated movies rely on. There was likely at least one person similar to one or the other of them that you knew in school. Overall, there were many great characters. In addition to those already mentioned, my favorite of the whole film is the glow worm Nim Galuu (voiced by Steven Tyler). He gives great personal advice and helps them find their way even if he doesn’t have all the answers. However, with the fantastic setting, culture and characters, the story just doesn’t hold the intensity that it should. I didn’t get deeply invested in any of the characters’ problems. There were aspects of the characters that were touched upon or hinted at that never saw any revelation. What was Queen Tera and General Ronin’s relationship before their responsibilities came to them? How did the Queen know that M.K. would be the key to victory, but not know how to avoid the problem being created in the first place? How did the family dog lose his leg? Well, okay, that last one isn’t perhaps as important, but since it was brought up that he had been a four legged dog before the separation and was now a three legged dog, it did make me wonder, which seems a silly distraction. In the end, while I certainly enjoyed the movie, it really comes down to the fact I wanted more. Certainly, there is a good version of wanting more when you see a movie. Wanting to see the characters face more challenges in a sequel is a good thing. But here it was seeing the outline of an epic storyline and not getting it fleshed out and paced in a way to make it feel truly larger than life. I do not believe this was because the members of the forest civilization were so small or because the story did not hold massive consequences. Instead, I fear what happened were that the choices made in pacing and elsewhere to create this family film kept it from growing as ‘epic’ as it needed to be. While there is no end scene in or after the credits, I did find the layout of the scrolling credits over a background of Bomba’s research notes and equipment to actually be an enjoyable addition.